Saturn Girl: Opening up the world of the 31st century is nothing compared to the doors of the mind this Legionnaire can tap into. A versitile ability in any environment, Saturn Girl's vast experience and inter-planetary knowledge makes her invaluable as co-team leader. Lobo: The 'Batman' of the team, the Main Man would never join a team of travelling do-gooders, but he'd find a kick out of their varied adventures keepin' his bounty hunting boredom at bay. His unpredictability and rep would mean the team would have no choice but to keep him round. The Questions: Deducing the mysteries of the unexplained isn't a case for one Question, but rather a journey for two. Vic and Renee prove no matter how small a group the team is splintered into, The Question is always on hand to answer. The Atom: Ray Palmer, founder of the new Challengers of the Unknown, wants to a team that doesn't just 'super-hero', but one that truely benefits mankind by their adventures. Play it forward, not avenge it after - now that's a challenge! Dial 'H' For Hero: Never knowing what powers/identity the magical dial will see Robbie Reed possess from adventure to adventure means the unknown no longer surrounds the team - it's inside them as well. 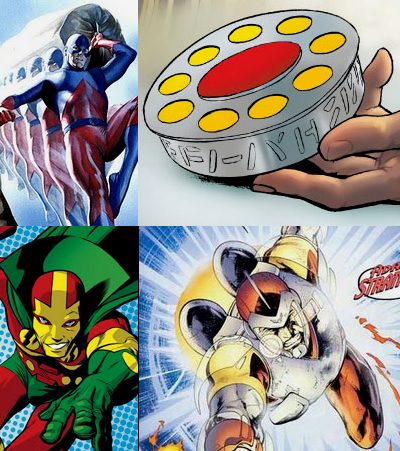 Mr Miracle: The ultimate escape artist brings his own exclusive know-how and technology to the table. In return, the Challengers offer the semi-jaded New God the all-new inescapable situations to fight! Adam Strange: The average Joe of the team comes with a jet-pack and raygun. With the Zeta technology having zapped his beloved Alanna to places unknown, Adam joins the team in the hopes their journey will lead him back to her. Who would be in your Challengers of the Unknown? Barbara Gordon; Ralph and Sue Dibny; John "Sargon" Sargent; Connor Kent and his dog Krypto. Guest-starring The Atom and Phantom Lady in a four-part miniseries: "Beware the Green Glob!" Phantom Lady - now that would be cool Dougie! I think my back-up's would be Zauriel and Kamandi. A little more Kirby and a touch of Morrison never hurt anyone! That's a cool concept and a fun exercise, Dan! Speaking of a touch of Morrison, I forgot about Tomorrow Woman! Patroller, a gorilla, and a wondering Ghost - how can anyone say this idea doesn't have legs Doug? i've really liked Adam Strange for several years now but it was the Justice League Unlimited cartoon that got me familiar with the Question character. love em both! Adam Strange is part of my DC trinity Dave, the other two of my top three always change but he's always held in. Sigh, if only we could get him on the telly! I'm sure he would take off! 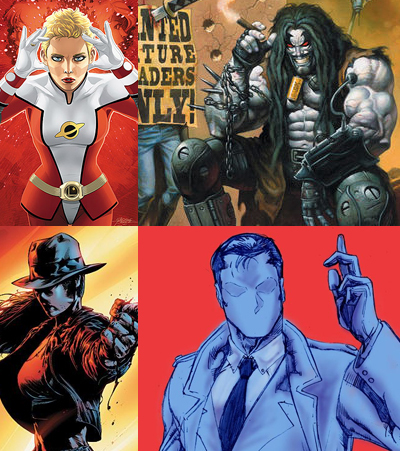 I like the idea of a new Doom Patrol featuring Deadman, Tomorrow Woman and Solovar. An avenging ghost, a glamorous android and a psychic gorilla (I'd give him an eyepatch). It's like the distillation of every bonkers cover of The Unexpected! They should ride around on those giant dogs from Atomic Knights, for good measure.